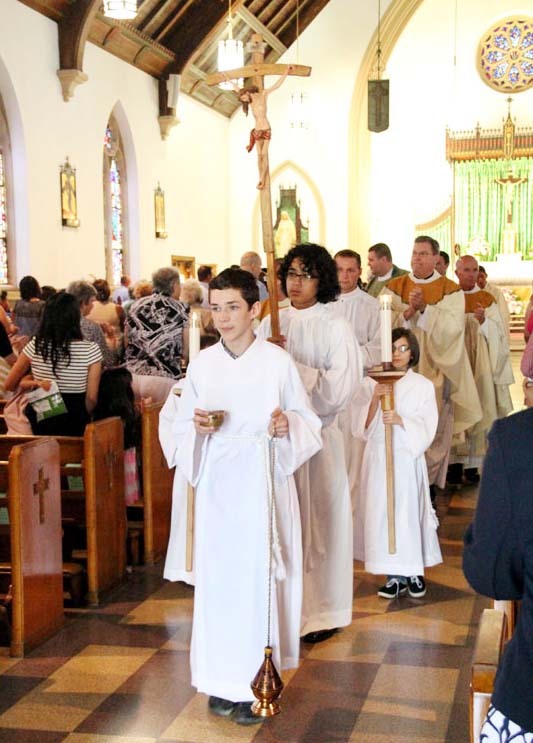 Thurifer Chris Bawley leads the closing procession, along with cross bearer Jaime Puente-Cantillo. 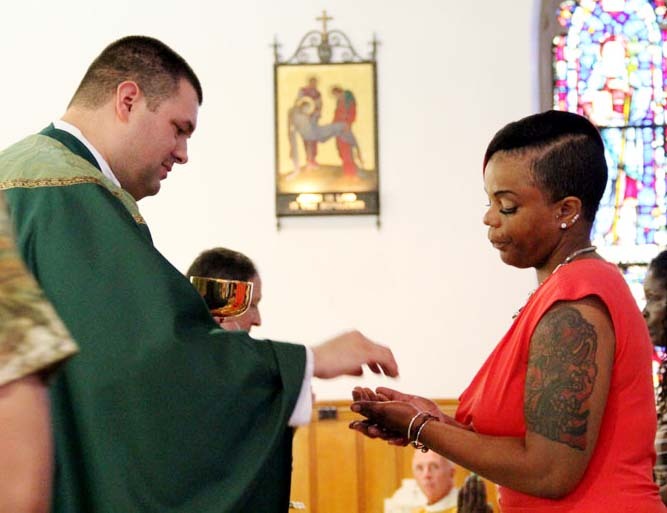 Father Whittingham places his hands on the Book of the Gospels and recites the Oath of Fidelity. 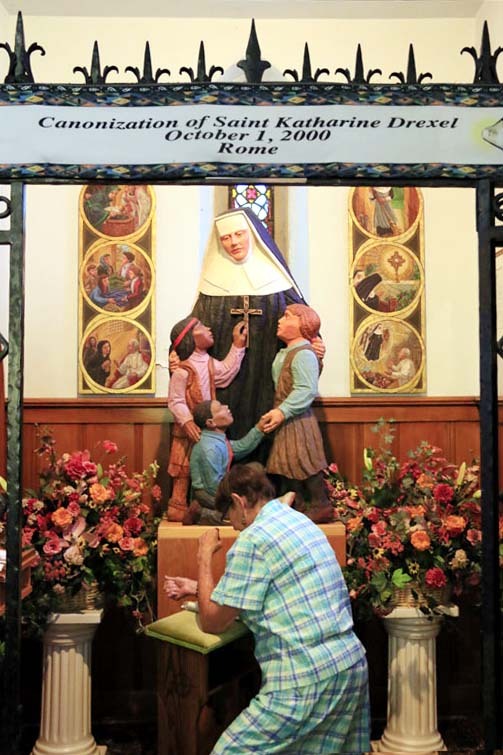 Parishioner and parish van driver Dorothy Murphy prays at the St. Katharine Drexel Shrine in the rear of the church. 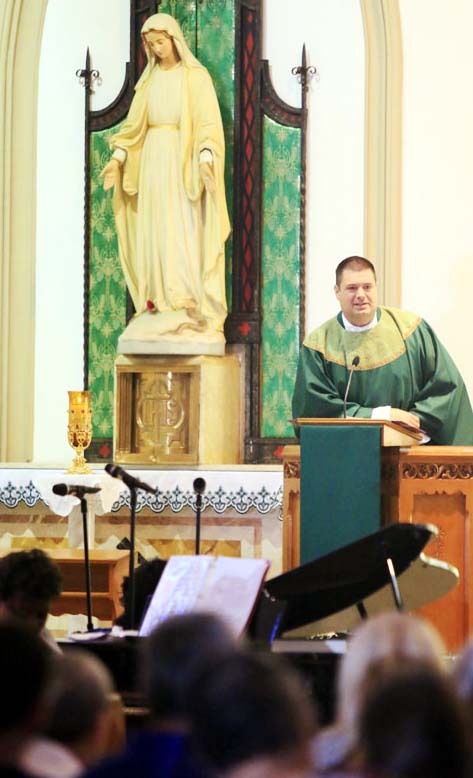 Father Whittingham address the congregation after Mass. 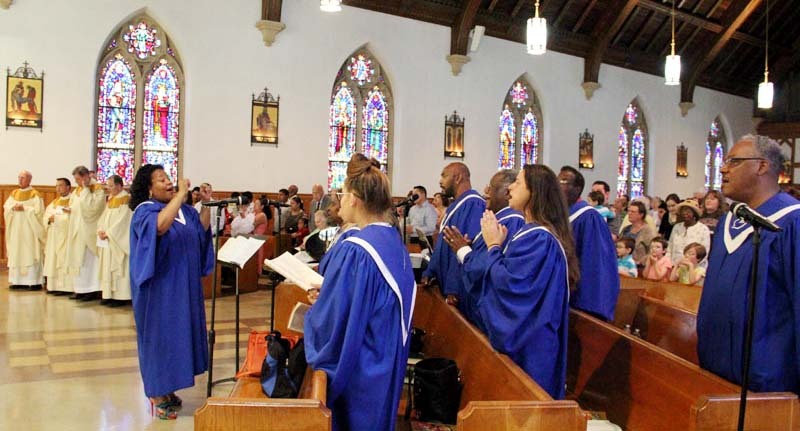 Mary Lopez (left) leads the parish choir. 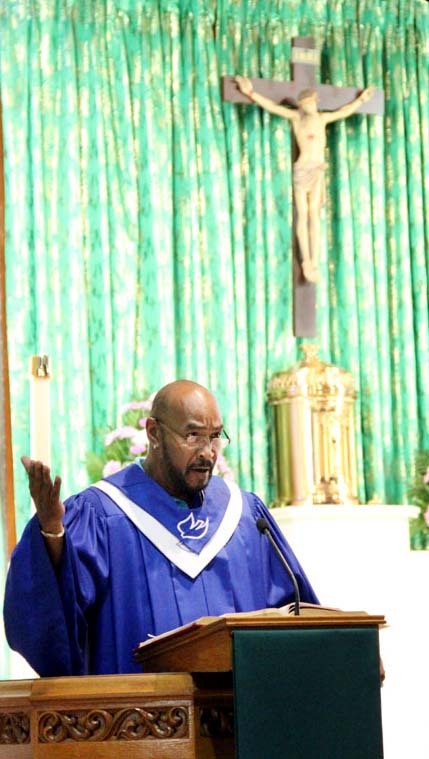 Cantor Tyrone Lopez leads the congregation in the Responsorial Psalm. 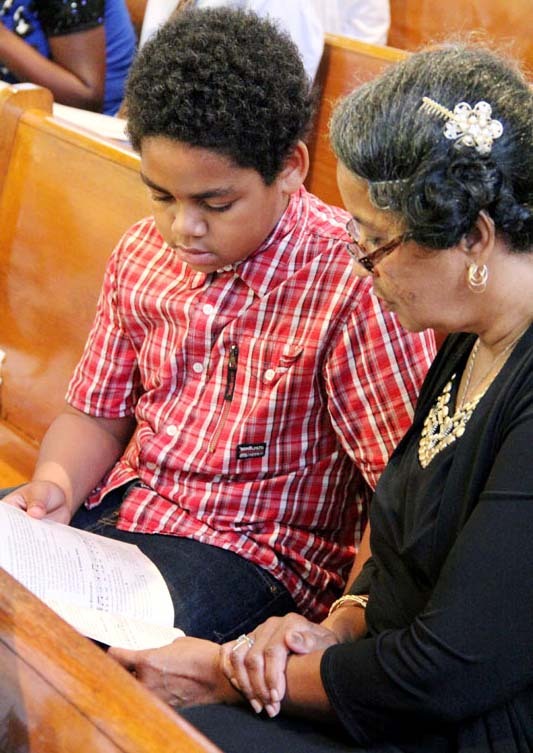 Fransetta Washington and her great-nephew Zanya Hubbard sing the psalm together. 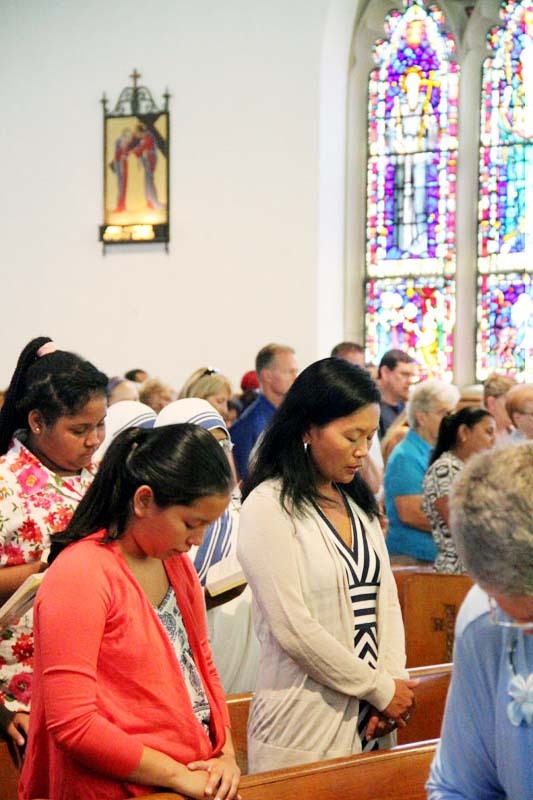 Joan Jackson (right) uses her missalette to pray the liturgy. 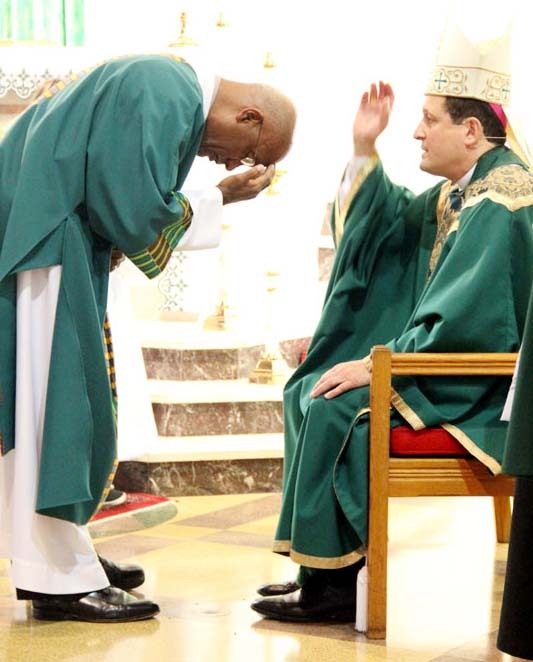 Bishop John McIntyre blesses Deacon Bill Bradley before he proclaims the Gospel. 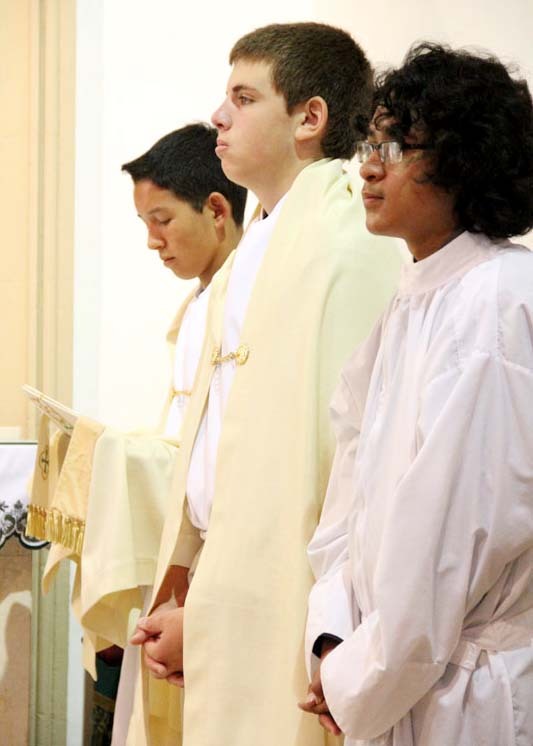 Participating in the liturgy are servers (from left) Matt Ziff, Nick Romeo and Jaime Puente-Cantillo. 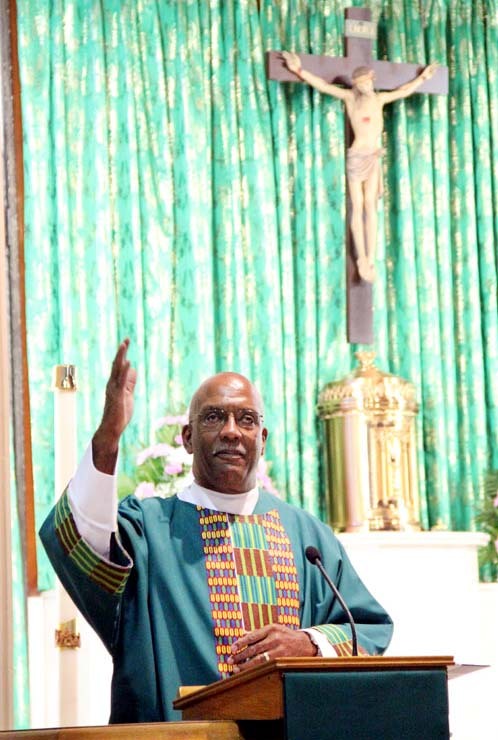 Father Whittingham (left) stands before Bishop McIntyre for the renewal of promises. 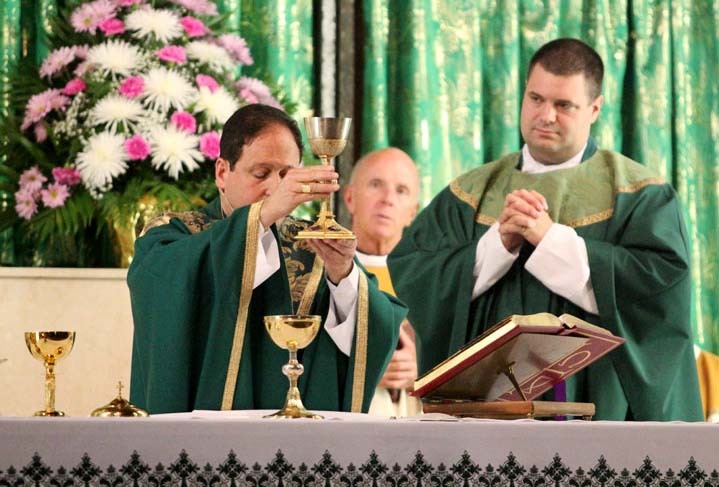 Father Whittingham prepares to recite the renewal of promises. 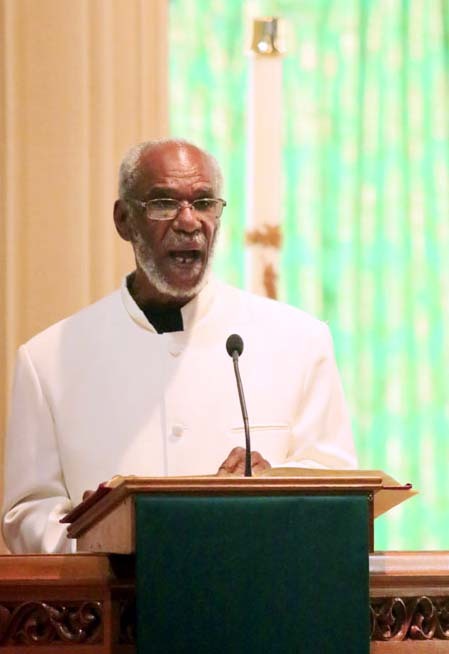 Father Whittingham leads the congregation in the Profession of Faith. 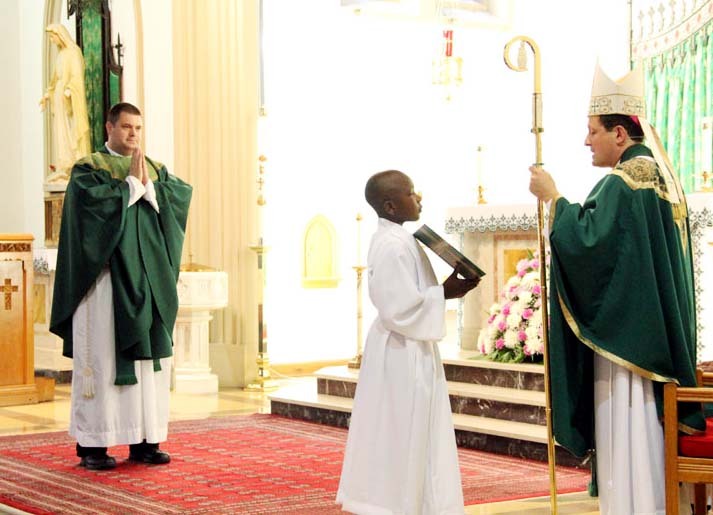 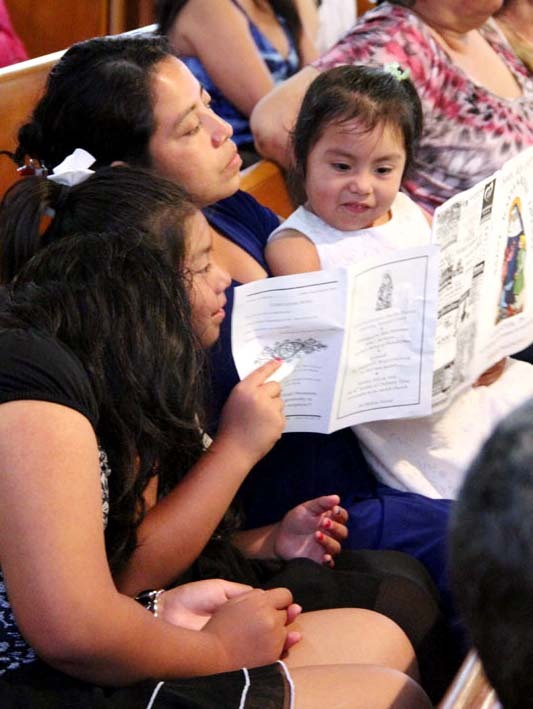 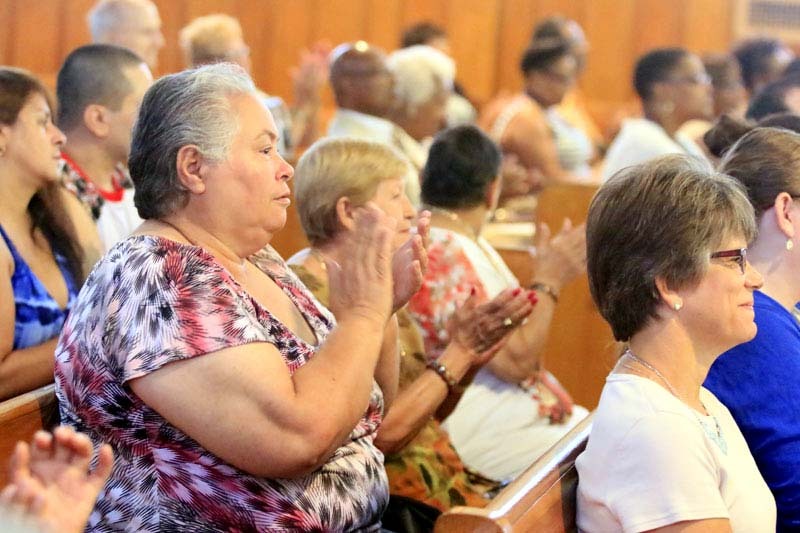 St. Katharine’s parishioners acclaim their new pastor. 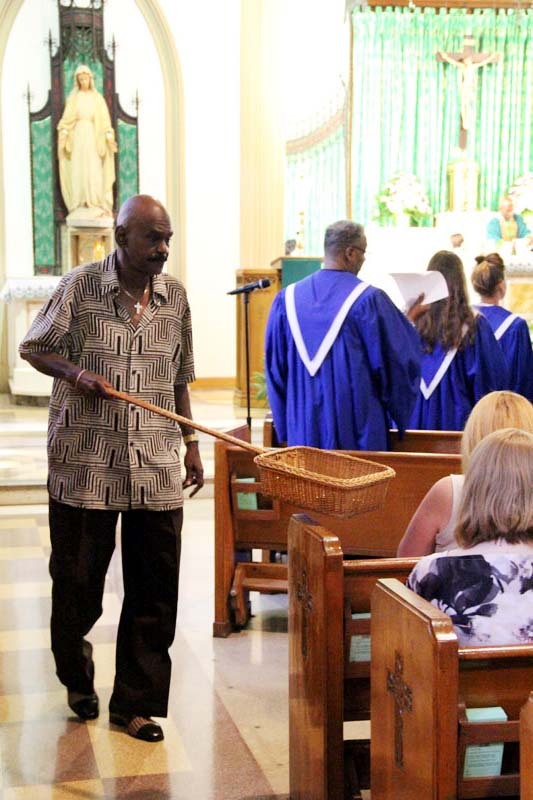 Father Whittingham greets representatives of the parish during a rite in the Mass. 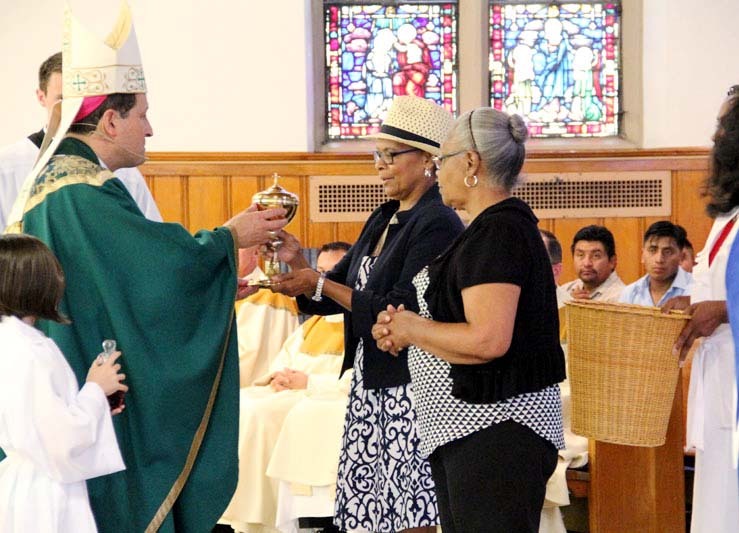 Parishioners present the offertory gifts to Bishop John McIntyre. 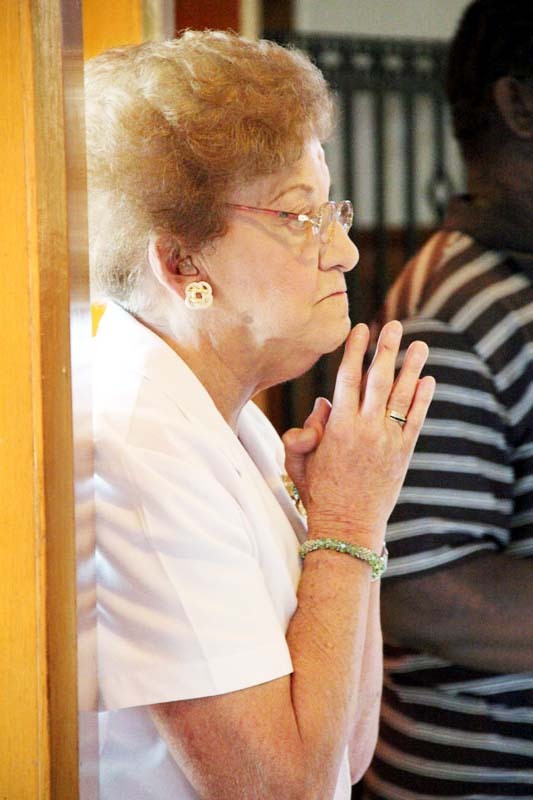 Gail Brown prays during the Liturgy of the Eucharist. 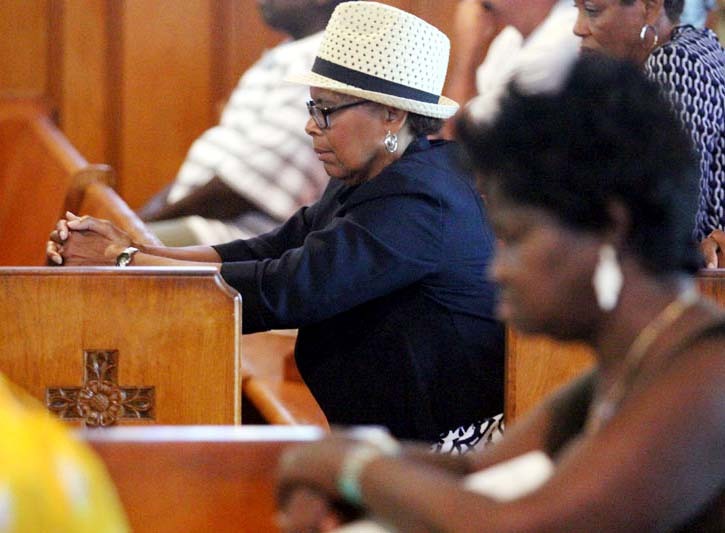 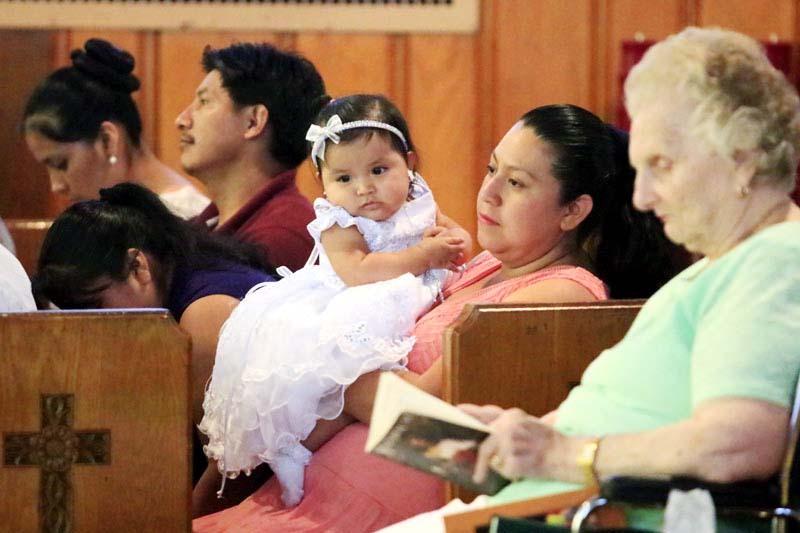 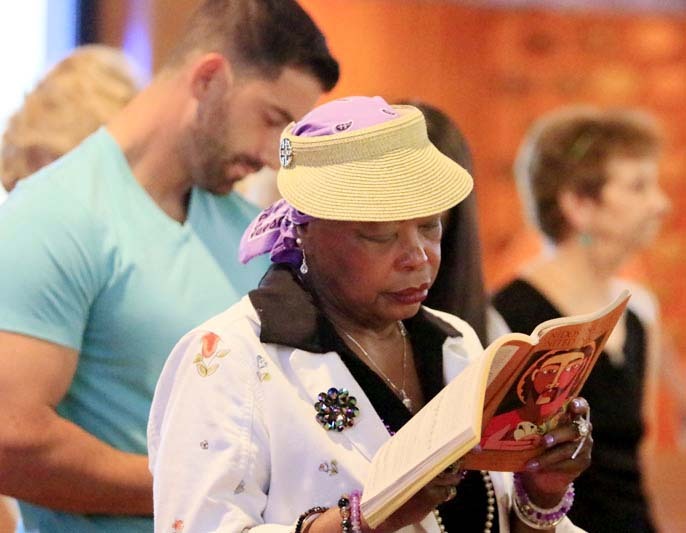 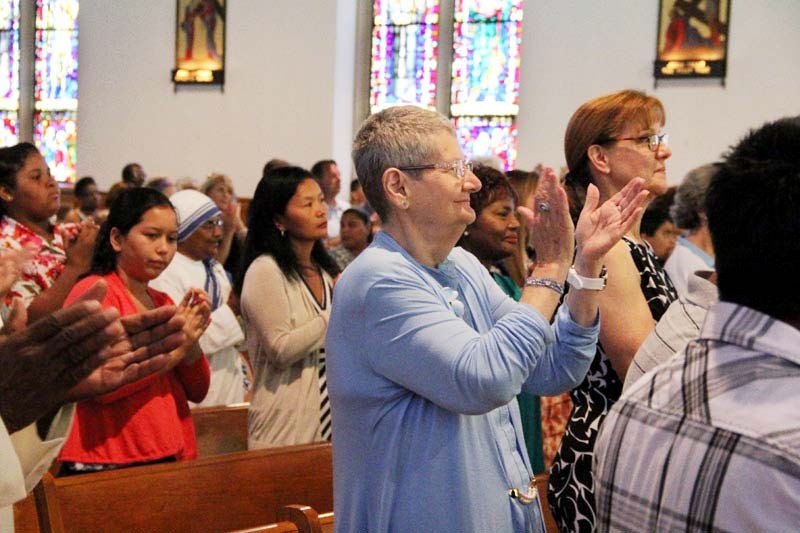 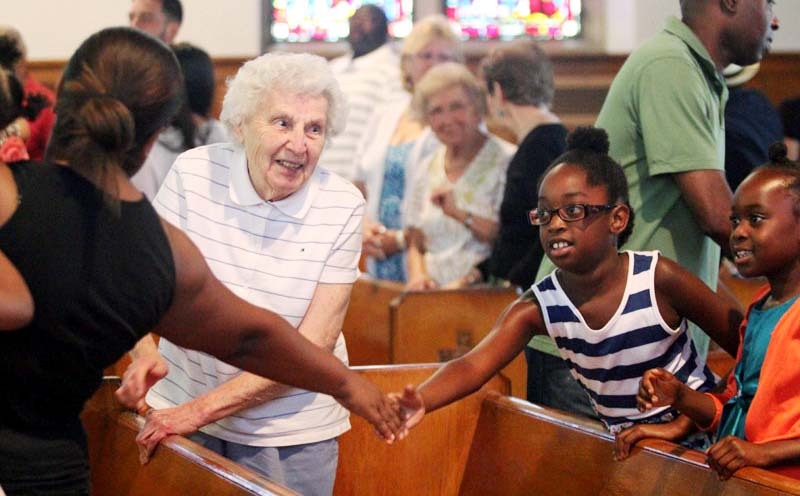 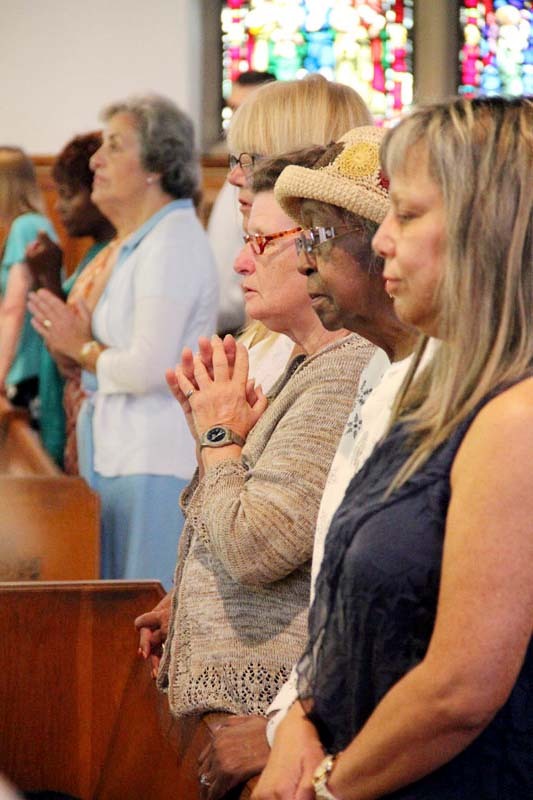 Members of the diverse parish congregation exchange a sign of peace. 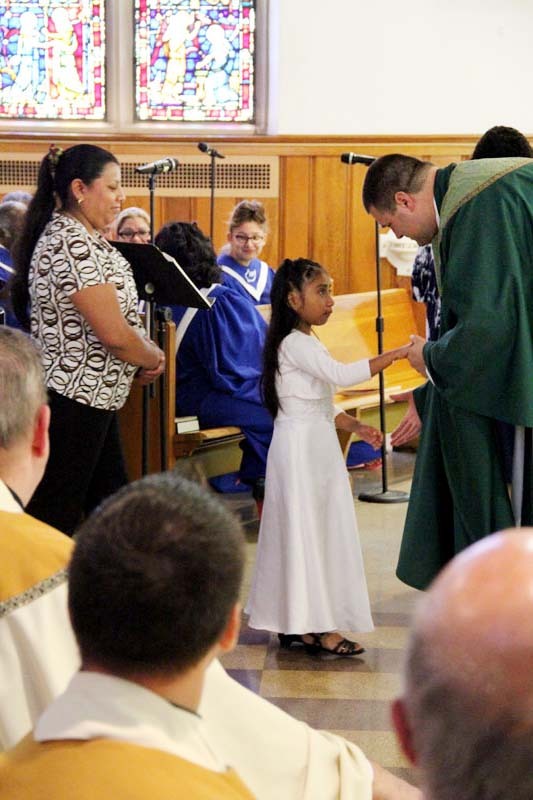 Mary Freeman receives holy Communion from her pastor, Father Tom Whittingham. 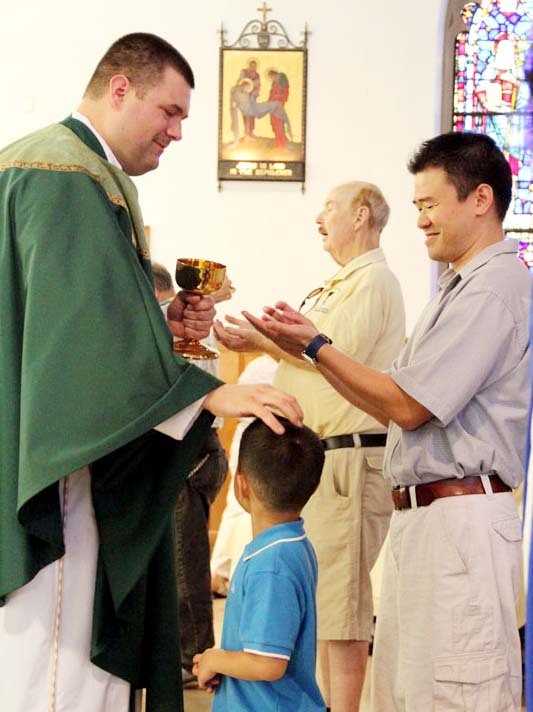 A loving and beautiful pastor for a beautiful and welcoming parish! 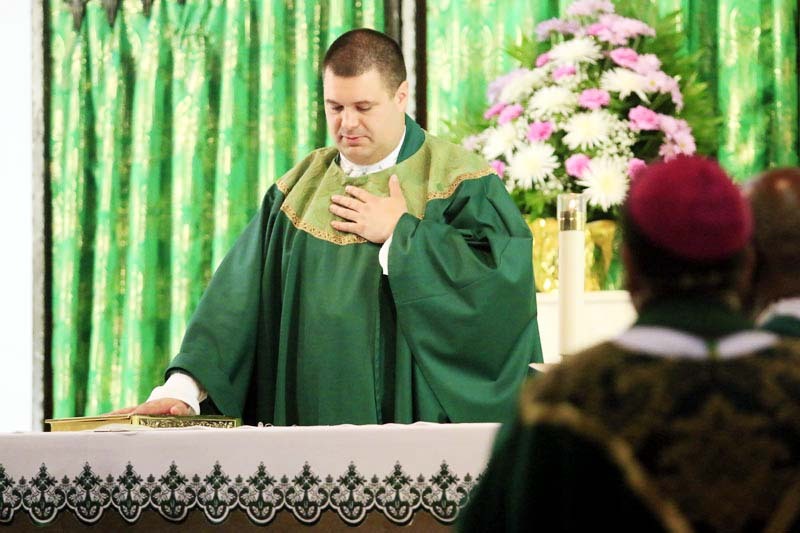 Wonderful pictures of the celebration of Father Tom’s installation as pastor. 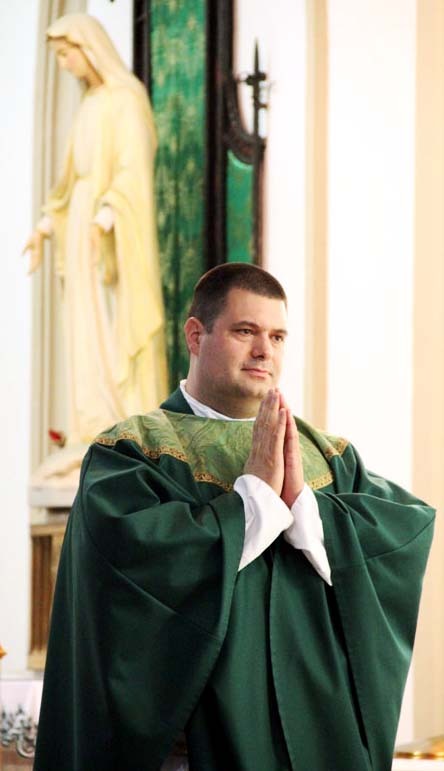 May he be blessed with many fruitful years at St. Katharine Drexel Parish! 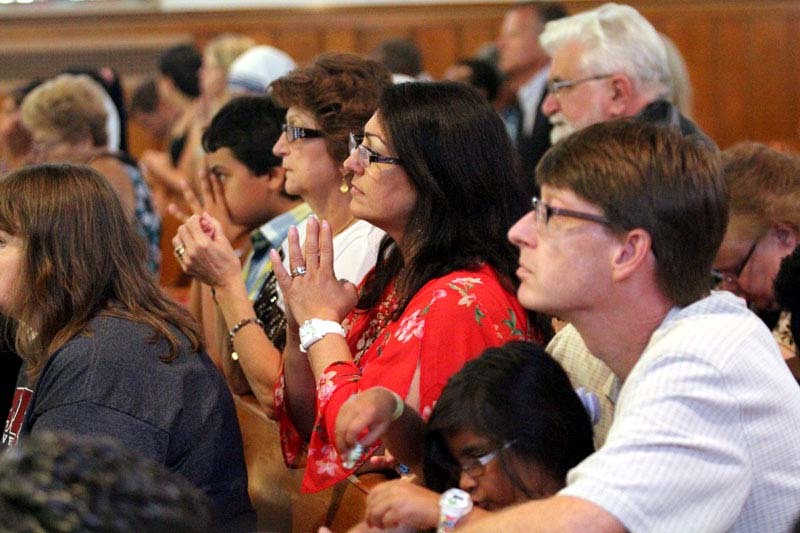 That looks like a wonderful parish in Chester. 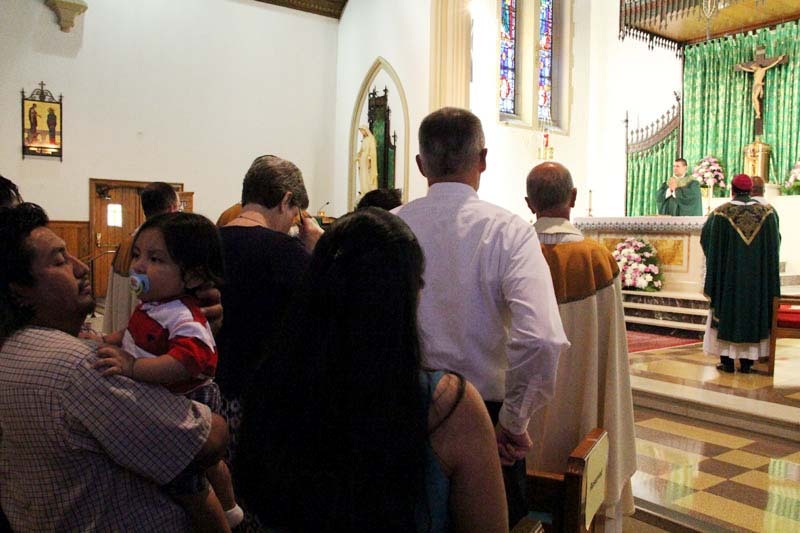 God Bless Father and God Bless the faithful of Chester. 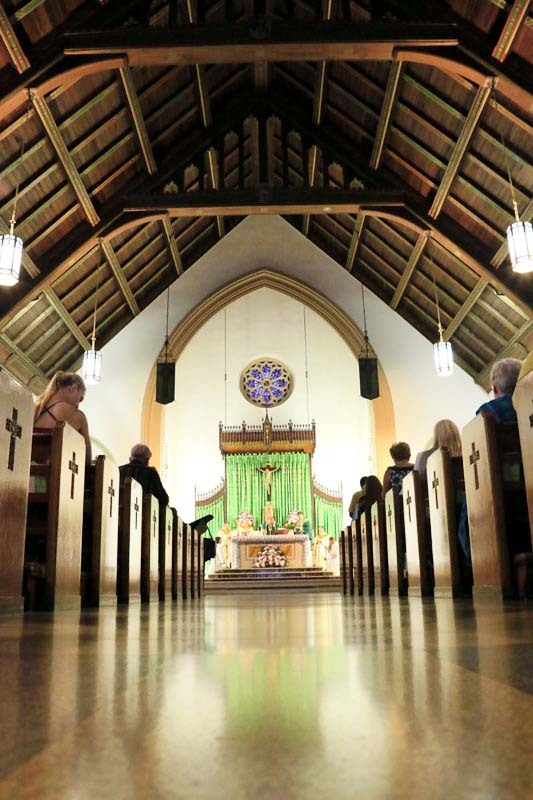 This looks like a wonderful place to come and worship. 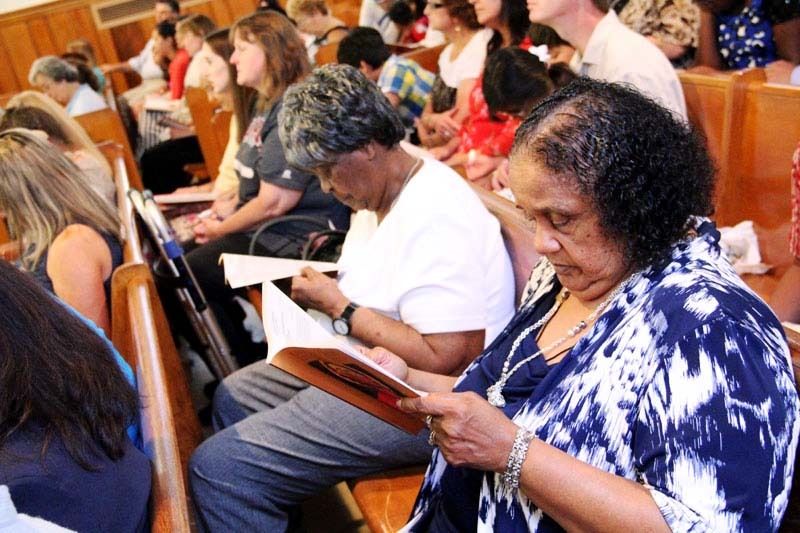 Thanks for posting the pictures that show the unity and diversity of the congregation.